يقع Clarion Hotel City Park Grand في Launceston City, لاونسيستون, هو خيار شائع بين المسافرين. يقع الفندق على بعد 1 km من مركز المدينة، ويؤمن الوصول إلى أهم مراكز المدينة. إن سهولة الوصول من الفندق إلى المعالم السياحية الشهيرة الكثيرة في المدينة كمثل بواجز بريوري, بوجس سنتر, Harvest Launceston, Community Farmersâ€™ Market هو استثنائي بحد ذاته. إن Clarion Hotel City Park Grand حريص على توفير الراحة للنزلاء، فلا يوفر الموظفون جهداً في تقديم أفضل الخدمات وضمان حسن الاستقبال. هذه بعض الخدمات الموجودة في هذا الفندق: كازينو, تسجيل وصول/خروج سريع, تخزين الأمتعة, واي فاي في المناطق العامة, صف السيارات. بالإضافة لهذا,تتضمن كل غرف الضيوف مجموعة واسعة من وسائل الراحة . بعض الغرف توفر حتى تلفزيون بشاشة مسطحة, حمام إضافي, مرحاض إضافي, مناشف, حوض الاسترخاء لإرضاء أكثر الضيوف تطلباً. إن مركز للياقة البدنية هو المكان الأمثل في الفندق للاسترخاء وتفريغ طاقتك بعد نهار طويل. مهما كانت أسبابك لزيارة لاونسيستون، فإن Clarion Hotel City Park Grand هو الخيار الأفضل لإقامة مثيرة وممتعة. يرجى العلم أن مكتب الاستقبال يغلق عند 09:30 PM؛ ولذلك يجب على النزلاء إعطاء ميعاد وصول تقريبي عند الحجز. Great location. Spacious rooms. Huge gym. Free parking. Ticked all the boxes. Receptionists very helpful. Restaurant is of high quality, with a good variety of dishes but make a reservation for yourself if wanting a meal as it is popular with the public as a place to celebrate a specila night for a couple. The coffee is good too. The location is very good, just a few mintures walk to the town with many restaurants and shops located. The room is clean, the decoration is nice. The bed is comfortable. The hotel has its own car park which is convinence for visitor who has a car. Location is convenient for exploring downtown Launceston and room is spacious and clean. Only downside was the absence of elevators as we had to climb up stairs to the top floor with our luggage since this is a historic building. Really loved the decor of the hotel and the rooms were very spacious and comfortable. We stayed in the 2 bedroom family suite in the main building. If there is anything to fault at all, it would just be the squeaky stairs! Paid SGD 448.54 for 2 nights in a Spa Suite. I will always respect hotels for putting me up around Christmas Eve and Day which is when we spent time at the Clarion. Our room was in the Stables building and was spacious, clean, and comfy. On Christmas Eve and Day we had dinner in the on site restaurant and the food, beer/wine, and service was great. On Christmas Day we woke up and there was a bag left at our door with spare towels and toiletries as we had the do not disturb sign on. This was a nice touch and something I would like to see in other hotels. Free wifi was excellent and the spa was a rare treat for me. Definitely stay here if you're hitting up Launceston. Boag's Brewery tour is a few minutes walk away! The hotel doesn't look so special on the outsid but insid is TERRIFIC! Wonderful thoughtful staff, charming heritage rooms, , excellent restaurant and very handy location. Can certainly recommend it. The room is very spacious, we just stayed one night and would definitely come back again. The complimentary breakfast is continental breakfast, extra charge is needed for hot food. If the breakfast covers hot bar would be great. The hotels location is central, has excellent dining and is very comfortable. We stayed only one night but really enjoyed the stay. The reception was very helpful on check in and gave us a number of suggestions of sights close by that we should see. I never even had to ask, it was as if she had read my mind. The rooms are tastefully decorated, comfortable and extremely clean. Should I ever stay in Launceston again this hotel would be my first choice. 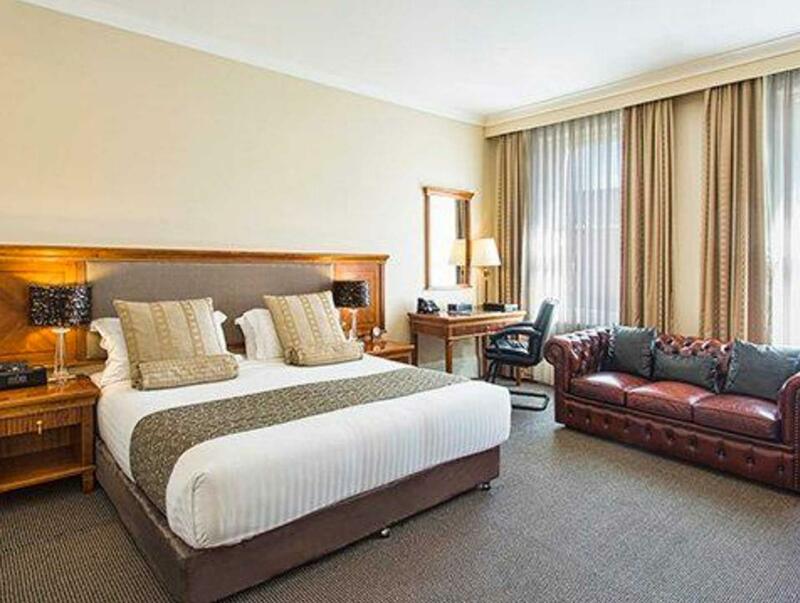 located in center of launceston, it's a great experience to stay in here. You can literally walk to stroll the city, they have offer ok food in the hotel. And room couldn't be better, we just love how they maintain the heritage of the room and combine it with modern touch yet you feel it's not awkward. Hotel is really nice, the only downside for this hotel it just they don't have lift which is not a really problem except for old people. We had room 35 in the main building which was very spacious, clean and comfortable. I liked the provision of fresh milk in the fridge and all the toiletries including toothbrush in case you had forgotten to pack yours. It just seemed quite well-thought out. Free wifi was very speedy unlike other hotels. It was also handy to have free on-site parking. Location was very close to the city park which was pleasant. We had dinners at Larceny's and were very pleased with the quality of the meal. We checked in again a couple of days later to room 34 which was a lot smaller than 35 with a tiny bathroom. It seems the room sizes can be very different. This review however is for room 35. Location is good with a large car park. Just away enough from the middle of town to keep things peaceful. Very close to City Park as the name suggests. The restaurant is very busy and rightfully so. Very good food and good staff. All in all, thoroughly enjoyed my stay, wish it was longer :) Will definitely be back again! Pleasantly surprised with the classic elegance and spaciousness of the room with modern comforts (ceiling heating lights in the toilet; strong WIFI reception ...). Location central too and the Saturday Harvest farmers' market was just a block away. It was excellent! Unfortunately we were unable to dine in the restaurant both evenings because they were booked out. We found other dining close by. The venue is in easy walking distance to the graduation ceremony, and reception. Book early if attending graduation. The Clarion was even more beautiful in real life than it was in pictures. Room was clean and well decorated, location is amazing as everywhere we wanted to go during our stay was a short walk away. The restaurant in the hotel which you can order room service through has beautiful tasty dishes that offer the tastes of Tasmania and truly showcase them. The staff were friendly and were more than happy to assist with any needs, I really enjoyed my stay here and felt it was worth the money. Lovely place with spa, modern furnish and clean. Central to the CBD and free parking a plus. Rooms are quite large and comfortable. Decent restaurant in Larceny, food reasonable compared to the rest of the city. No lifts for first floor rooms, so not suitable for everyone and slightly inconvenient. Right next to Albert Hall for graduation. Free wifi, but wifi only worked on one device for myself and did not work as well for my brother in law. Ensure you visit the QVMAG museum which was great. Cataract Gorge was nice. Alpaca park was really good, hands on fun, next to some good waterfalls to look at. Could not ask for anything better the decor the staff and the food were just Devine. It has that nice homely feeling from the moment you walk into the reception and the staff so very helpful and friendly. Quality rooms with quality fittings. Centrally located to major Launceston attractions and wine region. Very comfortable beds and good pillows. Nice two night stay. My only concern would be for older or disabled travelers. The two storey hotel had stairs that were fairly steep and I could see this as a problem for those not as mobile. Apart from this, i see no problems. I will definitely stay here again when next in Launceston.